I passed on to you what was most important and what had also been passed on to me—that Christ died for our sins, just as the Scriptures said. He was buried, and he was raised from the dead on the third day, as the Scriptures said. Rejoice for this validates everything that Jesus did and said! It also grants us a confirmed hope! We who are alive in Christ will one day be reunited with those who are asleep in Christ! The sin of this one man, Adam, caused death to rule over us, but all who receive God’s wonderful, gracious gift of righteousness will live in triumph over sin and death through this one man, Jesus Christ. Start the morning with Resurrection Rolls This link tells you how to use rolls to teach the real reason we celebrate Easter! Watch the sunrise and think on that first Easter sunrise when The Son rose!! Read the Easter story together from Matthew 27-28, Mark 15 – 16, or Luke 23-24. Sing praises together. Hooray is one song that children really love about the empty tomb. It is from Every Song a Bible Story from Maranatha Music. Read about what was happening on Day Seven of Passion Week. It was a dark day for Jesus’ disciples – they thought He was in the tomb, but they could not imagine what He was actually up to during their darkest moments!! Emphasize all day that when things look dark in our lives, God is busy at work, taking care of the things that concern us, even though we can’t see it. Make an empty tomb with just a paper plate cut in half. Color back side of one half of the plate brown. Color the top side of the other black which will be the inside of the tomb. Cut a stone out of the brown side. Staple the two sides together. You can crumple a piece of brown paper for the stone. 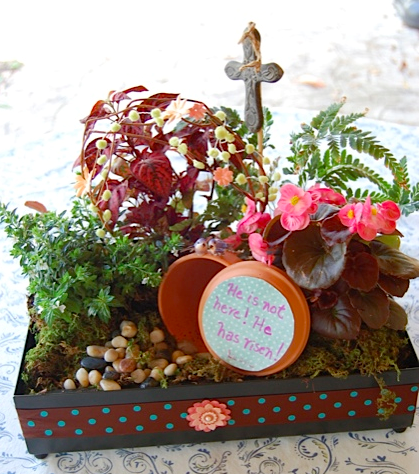 Get complete instructions here to make an Easter Garden. 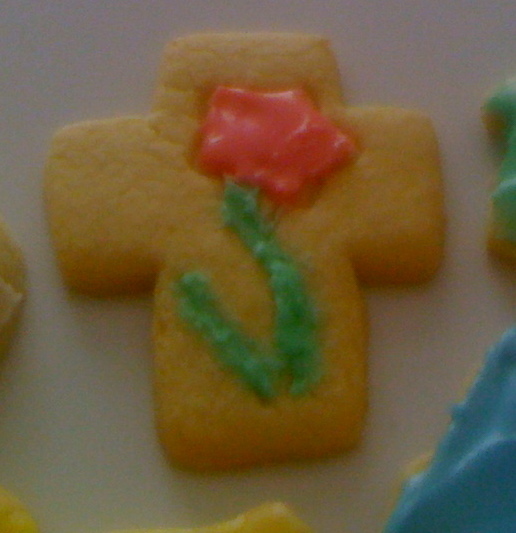 Tell the Easter Story with this Easter Cookie recipe. This is complete instructions with scriptures to share as you make the cookies. When done, the cookies are empty just like the tomb. Day Six of Passion Week is the day that Jesus was put on the cross. It is the most crucial focal point in history. Think with your children about the agony He went through – betrayal, arrest, false accusations, abandonment, beatings, harassment, and finally being nailed to a cross. – all this for someone else’s sins. It’s Friday, but Sunday’s coming is a video that depicts some of what was happening. 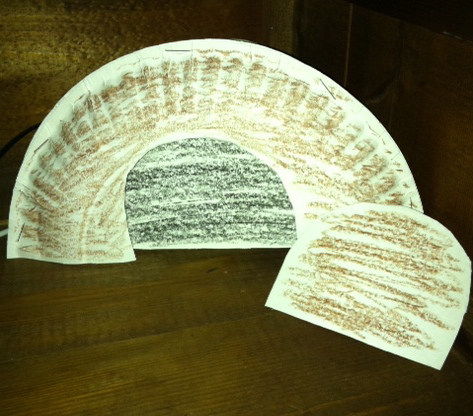 Resurrection Eggs is a wonderful teaching aid for helping your children visualize what Jesus was going through. Each egg contains a different symbol such as 3 coins, leather strip, crown of thorns, 3 nails, etc. It comes with a booklet telling the story related to each symbol and can be purchased at most Christian book stores. 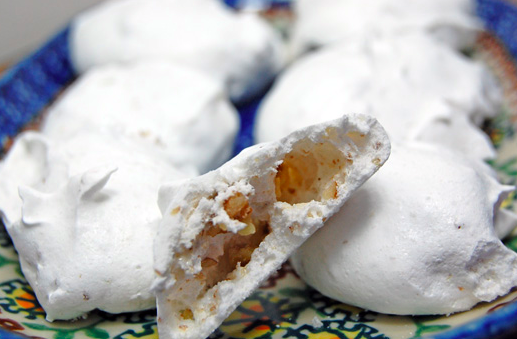 Click here for excellent instructions on making your own! 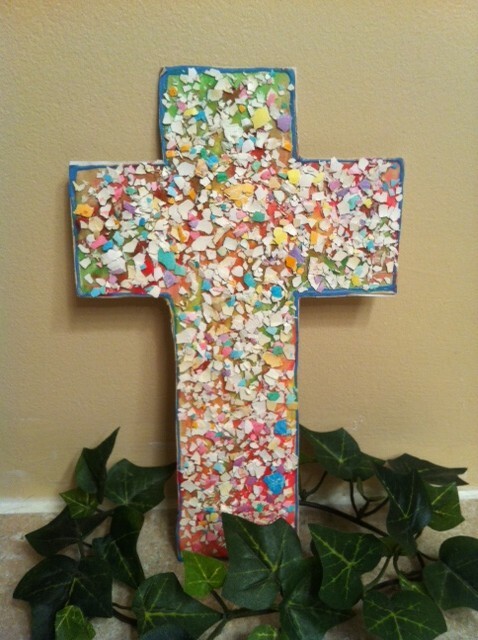 Save your colored egg shells to make a cross like the one in this picture. 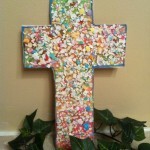 Cut a cross out of cardboard; cover it in glue; then sprinkle the crushed egg shells on it. Share with your children as you are making this that just as these egg shells are broken to make a beautiful picture, Jesus’ body was broken for us to make our lives beautiful and free from the punishment for sin. 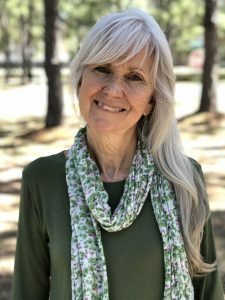 Read about the full day Jesus had as His impending death was fast approaching on Day Five of Passion Week. Read the story from a children’s Bible. 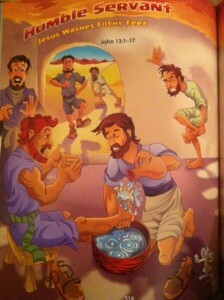 This picture is taken from My Awesome God Bible Storybook . Follow Jesus’ example. 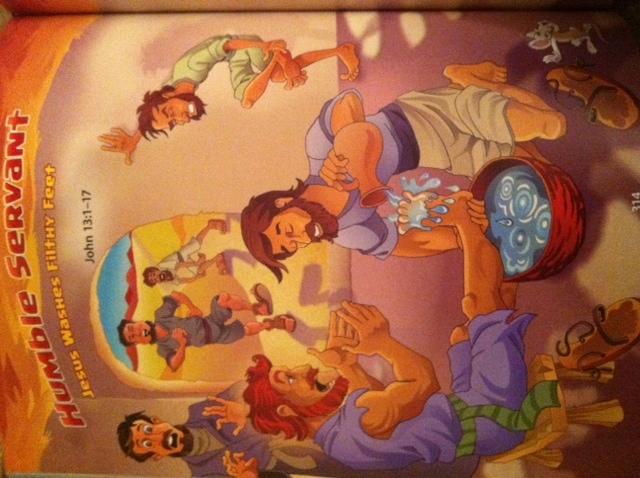 Wash each other’s feet. All day long talk about and look for ways to serve one another. Color Eggs. Tell your children you are serving them by boiling the eggs for them to color. Then as you color them, talk about why eggs are colored at Easter time. Jesus talked a lot about giving on Day Four of Passion Week. Of course He had every right to do that since He was about to give the ultimate gift of His life on the cross for the sins of the world. Everybody has done wrong things such as disobeying, lying, being unkind, etc. God calls this sin and there must be punishment for it. But Jesus loved us so much that He took the punishment for all the wrong things that were done or would ever be done. 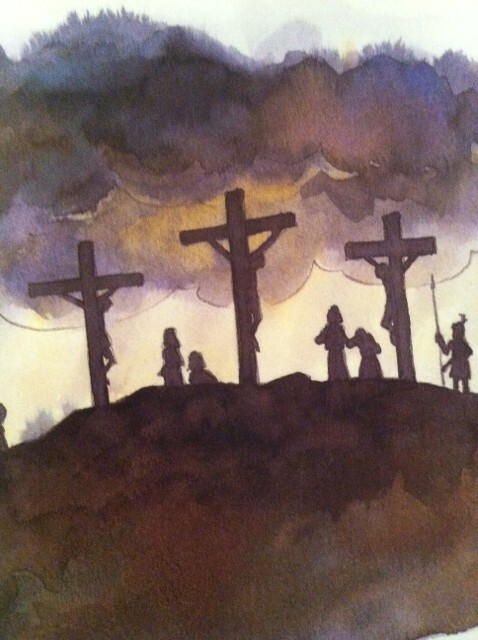 He died on the cross so we would not have to. We can now have a happy life forever with God. In your giving today, don’t forget to give thanks to Jesus for His gift of life to us. Here’s some simple thankful songs Make up your own songs together. Bake at 350 for about 12 minutes.